Divine Encounter: – Every man and woman who have the opportunity to pass through this world have that desire in their heart to be successful in every facet of their lives and have a wonderful experience here on earth and living in favour all through. This is not peculiar to Christian alone. Either one believes in God, free thinker or typical atheist, that desire is peculiar to everyone. While some fulfil that desire, the dream never become reality to many until they breathe their last breath. It is sad enough that that desire to be successful in life remain a day dream to many so call Christians. Many of us have listened to so many messages, preaching, talks, lectures, Bible studies, praise and worship program, prayer meeting on the mountain top, valley and level ground, yet nothing has happened. In other words, the situation has remained the same. Today, the story will change in Jesus name. Heaven will rewrite your story in Jesus name. All these are good, in actual fact; they are the right steps in the right direction. But one thing is needful and that will change the whole story and our lives will be that of heaven on earth. All our desire will be fulfilled and it will be evident in our lives. And what is that one thing that is needful for this to happen; it is what I call DIVINE ENCOUTER. 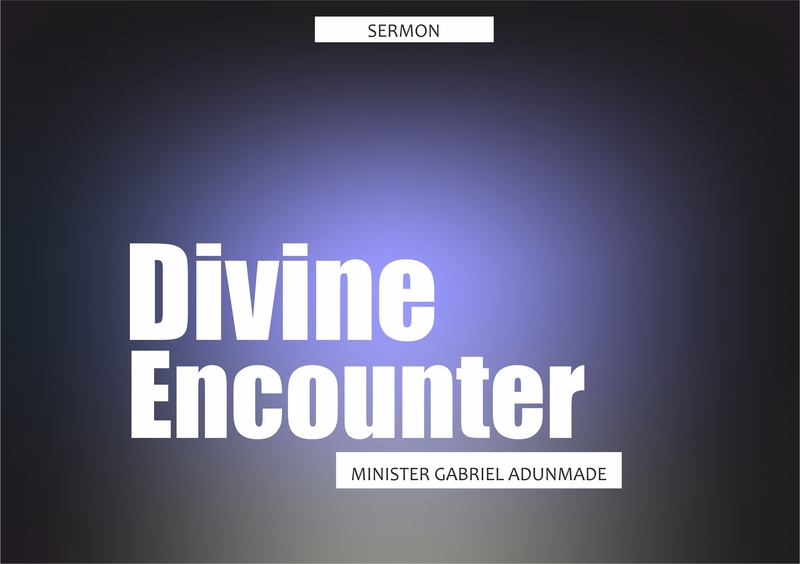 So if you ask me the title of this message, I will simply call it Divine encounter. Every successful character in the bible that we all like to be identified with, claim the blessing they had, prosper as they prospered, have breakthrough they had. People like Abraham, Isaac, Jacob, Joseph, Elijah and Elisha, Paul Peter, all the Apostles and even our Lord Jesus Christ. If we study their life history very well, we will discover that none of them was born with silver spoon in their mouth so to speak. In other words their lives were full of struggles in the beginning just like you and I. Remember early in live, Joseph and Mary had to ‘smuggle’ Jesus out to Egypt for Herod not to kill Him aside from being born in a manger. Abraham waited many years before becoming a father, Isaac was being driven from the well he dug and waited for 20 years before having Jacob and Esau. Jacob ran away from his brother who promised to kill him when their father die, he ran to his uncle Laban who played 419 on him for over 20years. Joseph had a dream, and from innocence of his heart, he told his brothers and father. This led to his predicaments for 17yrs. We all know the story very well. But at some point in their lives, something happened, and their lives were never the same again until their death. They continued to live in divine favour for the rest of their lives. That same thing will happen in your life today IJN. One more thing I want us to know is that what cause that remarkable difference in their lives happen within a space of 24hrs. And what was that thing; it was what is called DIVINE ENCOUNTER. What is this Divine encounter we are talking about? Of cause we all know that anything divine has to do with God, something beyond human reasoning or what man can’t find explanation to. I will simply call it proceeding from God that is divine. When they meet with divine encounter, there will be conflict, because they wouldn’t let go easily, but because the encounter is divine, they will surrender, and the will of God shall prevail in Jesus name. Let us check some characters in the bible, maybe one or two as time will permit to understand what we are talking about. Let us start with JACOB who was a surplanter but experienced a breakthrough after divine encounter with God. Jacob had an encounter with God which wrote his entire history afresh. Here we read the story of a man who experience Divine encounter. Several positive things happened to him as a result of the encounter. We all know the story very well, Jacob started on a very bad note. He was a corny man, crafty and subtle. No one would have thought that he could be eligible for Divine encounter. 1. He stole his brother’s blessing even though his brother was careless with his birth right in the first place, but that was not enough for him to use ‘wayo’ in rubbing him of his blessing. 2. Not only that, by the time he had gone to stay with his uncle; Laban rubbed him almost of his entire flock. Although that one also paid him back with his own coin by giving Leah to him instead of Racheal they agreed on after 7yrs. 3. While he was fleeing from his uncle, he had the news that frightened him. His brother Esau who he had defrauded some year earlier was coming to pay him a visit, he did not know whether to go forward or backward. He remembered the threat that his brother promised to kill him after the death of their father, Jacob knew death was hanging on his neck that his time on earth was almost up. He device a cunning method, sent some people with oxen, asses, flock, may be to pacify his brother and wait for what will become of those people. If he hears that his brother has killed them, he will know that going forward is not an option. Nobody knew that someone like that will be eligible for an encounter with the Almighty God. Your background does not determine your future or your front ground as I used to say. Jacob did something despite all these atrocities he committed which qualified him for divine encounter, and something happened to Jacob after this divine encounter. 1. The sentence of death that was hanging over his head was cancelled. Divine encounter will cancel death and destruction. What is prosperity to someone who is not alive to enjoy it. Of what use is money if one lacks good health. Divine encounter will not only lead to prosperity, but also Divine health to enjoy it. That will be your potion in Jesus name. 2. Jacob experienced a change of name. Name plays a significant role in the life of a person. You don’t blame devil for pursuing somebody whose name is ‘Esugbayi’ (meaning devil has received this). If that is you name you need to change it to Oluwagbayi. 3. Another benefit of Jacob encounter with God was that his future became settled. Your future is settled in Jesus name. ‭‭What this passage is simply saying is that your future will be alright. 4. Jacob was blessed by God as a result of that encounter. It is blessing of God that makes one rich without adding sorrow. When God blesses you, He blesses you comprehensively. It covers you and everything that is pertaining to you. Everything that matters in your life. Abraham enjoyed that comprehensive blessing which has extended to us today. The blessing you will receive today will extend to your future generation in Jesus name. Now before all this happened, Jacob did something. What did he do? 1. He gave what he had to secure what he wanted. Nothing is as wise as giving what you have to get what you need. Gen 32 vs 13-21. Solomon gave what he had to secure what he wanted. Jacob gave in an unusual manner, if you examine the details of what he gave, you will discover that Jacob wanted something serious from God. 2. Jacob wrestled in prayer. This was the second step taken by Jacob in his effort towards securing a divine encounter. It was not ordinary or gentleman’s prayer (not ‘jelenke prayers). When you wrestle with something, it means you are violent so to speak. When you see somebody who is desperately in need of something from God, you don’t need a prophet to tell you before you know. The way they shout, scream, jump, you may even be thinking, is this one alright? Does he think God is deaf? Blind Bathmeaus shouted Jesus son of David, have mercy on me. He could not see, but he could hear that something unusual was happening. He took that opportunity when he heard what was happening. People thought he was crazy. But did he get what he wanted from God? I have a CAC background, born and grew up in CAC, but went to Anglican grammar school (it is equivalent to Church of England here). If you know CAC and Anglican Church very well, you will know that when it comes to prayer, they are two opposites end in their perception to prayer. When a typical CAC man is praying, ‘ Oruko Jesu, Olorun Joseph Ayodele Babalola o, Olorun Orekoya, Olorun Medayese o. But for a typical Anglican man, prayer must be as solemn as possible. In fact all the prayers have already been written in a book, just read it and say amen. It is the same every Sunday. Throughout my 5yrs in secondary school, it was the same prayer every Sunday evening. In the morning on Sunday, we were allowed to attend our different denominations, but it was compulsory we must attend Anglican Sunday evening service. (In fact, our principal was an Anglican Reverend. To have Divine encounter with God, you need serious prayer, not only here, but more importantly in your closet. 3. You must be in the right place at the right time. I don’t need to dwell more on this. We all know where we supposed to be on Sunday and the time we are supposed to be there. Where we supposed to be on Wednesday evening and 1st Friday of every month between 10 pm and 1 am etc. Your own Divine encounter may not be in FOL, Holy Ghost congress or other big gathering, but might happen in your bedroom or bible study on Wednesday. Just as that of Jacob was in his closet and that of Bathemeaus was in open, mist of multitude. 4. Finally, what do we have to do to have divine encounter with God. Remember the parable of the talent. Jesus always talked in parable during His ministry on earth because parable is an earthly story with heavenly meaning. Mathew 25 vs 14-30 was the parable of man who went to a far country, but before leaving, gave talent to his 3 servants. 5 to 1, 2 to another and 1 to the 3rd servant, according to their several ability. 2 of them traded with their talents, while the 3rd one dug the ground and buried the one given to him. 1. Every believer in the kingdom of God has his/ her own ability. No one in the kingdom is without ability, without a talent. It is your responsibility to discover your own ability instead of envy others. Once you have discovered it, develop it and deploy it. You will discover that you will not lack good things and it will bring resource to you IJN. 2. If you maximise your potential ability and develop it, a unique reward is waiting for you at the end of it. What do I mean by unique reward. The servant with 5 talents and the one with 2 talents were not rewarded according to the no of talents they gained. They were rewarded equally, exactly the same reward. The responses to both were exactly the same. That was why it was unique. 3. The moment you discover, develop, deploy and maximise your ability, the one who has 10 cannot and will not be rewarded than you who have 4 and maximise it. God will never hold you accountable for what He has not given you. 4. The unprofitable servant will be cast into outer darkness. It is unprofitable workers that are usually fired when there is retrenchment in any establishment. Brother and sister, what do you do with the talent God has given you? When you do what you love and love what you do, Divine encounter is awaiting you. And as a bonafide child of God, what should you love doing, the will of God. 1. Father, please grant me the enablement, to discover, develop, deploy and maximise the ability and talent you have given me to your glory IJN. 2. Father, please, let me not be counted as unprofitable servant in your kingdom on the last day IJN. 3. Father, please, let me fulfil the purpose of you bringing me to this world before I return to you or you come to take me home IJN.